There are plenty of reasons why cyclists are starting to adopt bike cameras these days. For the same reasons that motorists are adopting dashboard cameras, biking cameras provide documentation of anything that happens on the road. That might be useful for insurance/police investigation purposes in case of an accident, but it also might be useful simply to capture interesting things. 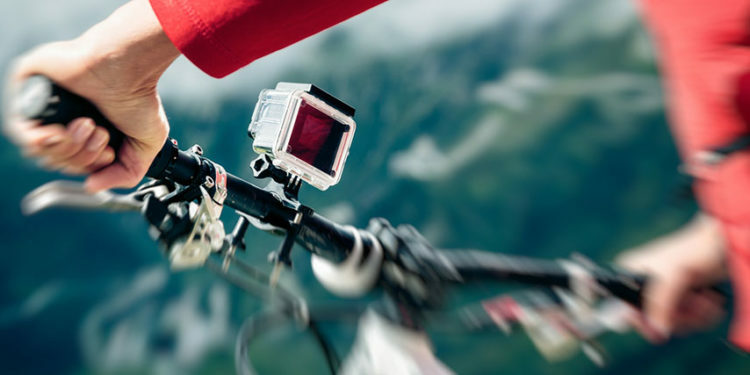 If you’re a mountain or sports biker, you might have totally different reasons for wanting a bicycle mounted camera. Some motorcycles even use after-market rear cameras & LCD monitors as a way to provide a rear view without relying on side mirrors. This front-mounting bike camera attaches with a separate handlebar mount (available here) to record up to 8 hours of cycling time. It also has a light which you can turn on or off as needed at night, although this will shorten battery life for recording. This uses a rechargeable battery (included) which takes about two and a half hours to get a full charge from zero juice. This front-facing cycling camera is like a dash cam for a bicycle and it weighs less than 6 ounces so you may even forget it’s there! To watch footage, simply connect the camera to your Mac or PC computer with the included USB cable or use the Bluetooth feature for accessing clips from your phone wirelessly. Uses a Micro SD card to record footage on to – not included but you can buy one here. The built in light is 600 lumens that works in a variety of modes & brightnesses. This biking camera even has a built in alarm which can notify your phone when your bicycle is moved. Here’s one of the best bicycle cameras that mounts on the front handlebars of your bike. It comes with a mounting kit to attach to your bicycle. It doesn’t come with a 128GB Micro SD card but you can pick one up separately here if you don’t have one already. The flashlight has a few different modes and the camera has a “Bat Eye” mode which captures clearer footage at night than would otherwise be possible. Control the app using Wifi from your phone. This rear facing bicycle camera records in 1080p HD and has a long lasting tail light for cycling at night. The tail light for your bike has three different modes you can select and the camera even records audio too. The battery will last up to 7 hours between charges although it’ll be shorter if you use it with both the lights and the camera at the same time. Records on Micro SD cards (available separately here). Also has a built in bike alarm to alert your smartphone if your bike is moved (and record the location too). This WiFi cycling camera records everything behind you in a wide fish-eye field of view and can transmit it to your phone wirelessly (handlebar mount for phone sold separately; but this kit includes all the mounting supplies you need to hook the camera up to your bicycle). Has an app for both iPhone or Android phones and works up to 5 hours on its rechargeable internal battery. This is designed to be a wireless “live” rear-facing security camera for your bike. One difference between this camera for bikes and some others is that it doesn’t record on internal storage and instead records directly on your smartphone. For some people this might be an advantage (because you don’t have to transfer the footage to watch it) but for others this might be a drawback (if your phone is low on storage space already). Should you take the bike camera off your bike when you’re not using it? This will depend on the general safety of the area that you’re using your bike and your own comfort level with leaving a camera mounted on your bike while it’s locked up on a public bike rack. Some of these biking cameras are easy to detach without tools but others are more permanently mounted on to your bike, so you’ll need to make that choice depending on circumstances and the type of camera mount you’re using. How do you mount one of these cycling cameras to a bike? Several of these bike cams come with their own mounting kits. For the ones that don’t we’ve tried to link to the appropriate mounting kit separately. Depending on your use case, you might just use a GoPro action camera mounted to your handlebars using a standard GoPro bike mounting kit. What are possible benefits of mounting a camera on my bicycle? Some bike cameras are better than others so depending on your desired use case, you’ll be able to narrow down your options to pick the best bike camera for you. Do bicycle cameras record sound or just video? Some bike cams record sound, others don’t. If recording sound is important to you, be sure to check the individual product specifications of each bike camera. Many bicycle cameras do record some sound, although it might not be great quality (especially with wind noise from the bike moving quickly), it’s certainly enough to tell if a car horn is honking, etc.